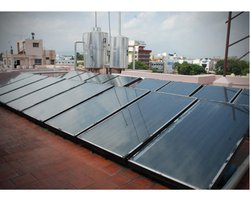 We are a leading Manufacturer of flat plate commercial solar water heater and evacuated tube commercial solar water heater from Coimbatore, India. Collector Insulation Fiberglass insulation@ 48Kg/M cube density. The solar hot water system is based on the principle of back body absorption. The black surface of the collector absorbs the heat energy from the sun rays and transfer it to the water passing through the copper tubes. Hot water is lighter in density, raised to the insulated storage tank and an equal amount of cold water replaces this hot water from the copper tubes. 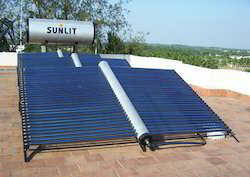 Evacuated tubes are the absorber of the solar water heater. They absorb solar energy converting it into heat for use in water heating. Evacuated tubes have already been used for years in Germany, Canada, China, and the UK. There are several types of evacuated tubes in use in the solar industry. At Sunlit, we use the "Twin-Glass Tube" technology. This type of tube is chosen for its reliability and better performance.